CSEM is a private Swiss research and technology organisation (RTO). Our 400-strong workforce specialises in micro and nanotechnologies, systems and surface engineering, and low-power information and communications technologies. Our mission is to deliver advanced technologies and unique research and development services to industry by targeting emerging, strategic, high-impact technologies for the benefit of our customers and partners. In this way new products are brought to market and new ventures are continuously created. Our technologies are able to address the needs of a very wide range of fields, from healthcare, watch-making, aerospace, security and medical, to consumer electronics and cleantech. We develop innovative technology platforms through four strategic programmes – microsystems technology, systems engineering, ultra-low-power integrated systems and surface technologies – corresponding to domains in which we have acquired over the years a national and international reputation. Our multidisciplinary, system-oriented approach promotes innovation with a special emphasis on the integration aspects of micro and nano-systems and subsystems. Miniaturisation, precision and reliability, all of which are at the heart of our competencies, are of paramount importance to medical technologies. It is therefore only natural that CSEM produces, year after year, cutting-edge innovation for our customers in the medical technology market. CSEM’s microsystems technology activity develops and integrates custom or standard innovative microsystems (sensors, actuators and communication micro-systems) to provide new, integrated solutions to industrial and institutional customers. The integration of microsystems is a key element for many future high-technology application areas. Therefore CSEM provides a complete technology chain for small-scale production including reliability studies and quality control. The target markets are those in which miniaturisation and reliability are required, such as medical technology and biotechnology, the watch industry, space and aeronautics, environmental control and monitoring, and information and communication technologies. Our systems engineering specialists master the techniques required to analyse, design and build instrumentation systems by investigating the convergence of microtechnology and flexure structures. Additionally, we develop high-end technological activities to address current and future industrial needs in automation and microassembly, to enable continuous and unobtrusive (wearable) health monitoring under ambulatory conditions, and to develop energy-efficient control and sensing concepts within the context of environmental systems. The surface technologies activities of CSEM investigate functionalised surface systems structured on the submicron scale and develop technologies to mass manufacture them with very high accuracy, and at a reasonable cost. Surface functionalities such as wetting, optical reflectivity, (bio-) molecular adsorption, or electronic properties are built in by extending the capabilities of known large-area manufacturing technologies such as embossing, injection moulding, polymer self-assembly, and UV-lithography to precisions in the submicron to nanometer range. The results of our R&D work include nanometer-scale membranes for protein filtration, artificial organs, fibre sensors for wound monitoring, and new coatings for prostheses and gas sensors. Our surface technologies contribute to innovative solutions in many different fields ranging from integrated bio-sensors to novel photovoltaic cells and innovative lighting devices to name but a few. The ultra-low-power (ULP) integrated systems engineers at CSEM perform applied research and development of ultra-low-power embedded systems with a strong focus on wireless and vision systems. The latter take advantage of CSEM’s specific system-on-chip (SoC) and dedicated embedded software to achieve the lowest power consumption for any given application. The design of ULP circuits is key, as is the embedded software, in reducing power consumption by, for example, developing low-power protocols, low-energy power management schemes, and low-power real-time software. It is of primary importance that the hardware (SoC) and software (embedded software applications) are developed jointly to achieve the global power and hardware-resource optimisation of the complete system. Implantable and wearable systems with low power requirements, in terms of processing and communications, benefit from this technology and new products continuously find their way to market using these CSEM technologies. The structure of our organisation allows these technologies to be combined in the same device. This results in products and solutions that bring disruptive innovation to the market and give our customers a sustainable competitive advantage in the marketplace. CSEM's know-how in the conception of micro electro-mechanical systems suitable for biological applications (BioMEMS) has led to the development of a portfolio of novel platforms for cell growth. 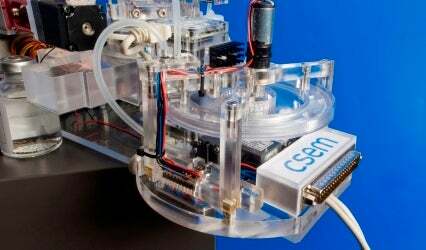 CSEM has developed a modular cell-handling system, CellFactor, to provide automated, high volume processing of large biological entities such as oocytes, fish larvae, cell clusters, tissue samples, and pollen.